This name uses Eastern Slavic naming customs; the patronymic is Oleksiyovychand the family name is Poroshenko. 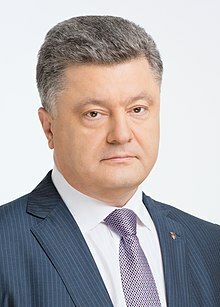 Petro Oleksiyovych Poroshenko (Ukrainian : Петро́ Олексі́йович Пороше́нко, pronounced [pɛˈtrɔ ɔlɛkˈsʲijɔwɪtʃ pɔrɔˈʃɛnkɔ] ; born 26 September 1965  ) is the fifth and current President of Ukraine since 2014. He served as the Minister of Foreign Affairs from 2009 to 2010, and as the Minister of Trade and Economic Development in 2012. From 2007 until 2012, Poroshenko headed the Council of Ukraine's National Bank. Outside government, Poroshenko has been a prominent Ukrainian oligarch  with a lucrative career in acquiring and building assets. His most recognized brands are Roshen, the large-scale confectionery company which has earned him the nickname of "Chocolate King",  and the TV channel 5 kanal , an all-news national TV broadcaster. Due to the scale of his business holdings in the manufacturing, agriculture and financial sectors, his political influence that included several stints at government prior to his presidency, and ownership of an influential mass-media outlet, Poroshenko has long been considered one of the prominent Ukrainian oligarchs even though not the most influential among them. 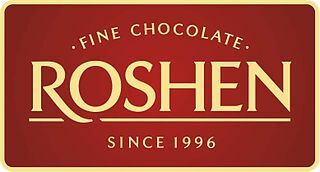 Roshen Confectionery Corporation is a Ukrainian confectionery manufacturing group. The leading manufacturer of confectionery products in the country, it operates facilities in the Ukrainian cities of Kiev, Vinnytsia and Kremenchuk, as well as in Budapest, Hungary and Klaipėda, Lithuania. The name of the company was derived from the last name of its owner, Poroshenko. 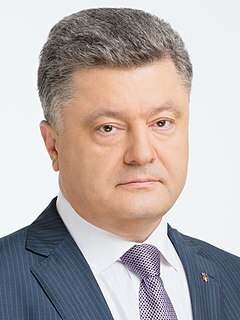 Presidential elections were held in Ukraine on 25 May 2014, resulting in Petro Poroshenko being elected President of Ukraine. Originally scheduled to take place on 29 March 2015, the date was changed following the 2014 Ukrainian revolution. Poroshenko won the elections with 54.7% of the votes, enough to win in a single round. His closest competitor was Yulia Tymoshenko, who emerged with 12.81% of the votes. The Central Election Commission reported voter turnout at over 60% excluding those regions not under government control. Since Poroshenko obtained an absolute majority in the first round, a run-off second ballot was unnecessary. 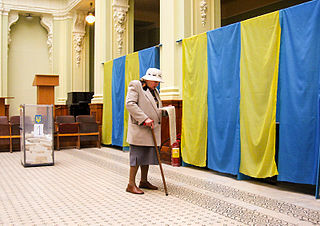 Presidential elections were held in Ukraine on 31 March and 21 April 2019. Unified Sports Classification System of the USSR is a document which provided general Soviet physical education system requirements for both athletes and coaches. Similar systems still exist today in several former Soviet republics. Shevchenko University or officially the Taras Shevchenko National University of Kyiv, colloquially known in Ukrainian as KNU is located in Kiev, the capital of Ukraine. KNU is ranked within top 500 Universities in the world. It is the third oldest university in Ukraine after the University of Lviv and University of Kharkiv. Currently, its structure consists of fifteen faculties and five institutes. It was founded in 1834 as the Kiev Imperial University of Saint Vladimir, and since then it has changed its name several times. During the Soviet Union era, Taras Shevchenko University was one of the top-three universities in the USSR, along with Moscow State University and Leningrad State University. It is ranked as the best university in Ukraine in many rankings. Throughout history, the university has produced many famous alumni including Nikolay Bunge, Mykhailo Drahomanov, Mykhailo Hrushevskyi, Nikolai Berdyaev, Mikhail Bulgakov, Viacheslav Chornovil, Leonid Kravchuk, and many others. Taras Shevchenko himself, banned from educational activities for political reasons, worked for the Kyiv University as a field researcher. The Governor of Odesa Oblast is the head of executive branch for the Odesa Oblast. Between 1996 and 1998, UkrPromInvest acquired control over several state-owned confectionery enterprises which were combined into the Roshen group in 1996, creating the largest confectionery manufacturing operation in Ukraine. His business success in this industry earned him the nickname "Chocolate King". Poroshenko's business empire also includes several car and bus factories, Kuznya na Rybalskomu shipyard, the 5 Kanal television channel,  as well as other businesses in Ukraine. Although not the most prominent in the list of his business holdings, the assets that drew much recent media attention, and often controversy, are the confectionery factory in Lipetsk, Russia, that became controversial due to the Russian military intervention in Ukraine (2014–present), the Sevastopol Marine Plant (Sevmorzavod) that has been confiscated after the 2014 Russian forcible annexation of Crimea and the media outlet 5 kanal, particularly because of Poroshenko's repeated refusal to sell an influential media asset following his accession to presidency. According to the annual ranking of the richest people in Ukraine  published by the Ukrainian journal Novoye Vremya and conducted jointly with Dragon Capital, a leading investment company in Ukraine, published in October 2015, president Poroshenko was found to be the only one from the top ten list whose asset value grew since the previous year's ranking. The estimate of his assets was set at $979 million USD, a 20% growth, and his ranking increased from 9th to 6th wealthiest person in Ukraine. The article noted that Poroshenko remained one of the only two European leaders who owned a business empire of such scale, with Silvio Berlusconi of Italy being the other. Poroshenko and Viktor Yushchenko during the meeting before Mukacheve mayoral election on 16 April 2004. Poroshenko attending a U.S. Independence Day celebration at the U.S. Embassy in Kiev, 6 July 2005. In the March 2006 parliamentary election, Poroshenko was re-elected to the Ukrainian parliament with the support of Our Ukraine electoral bloc. He chaired the parliamentary Committee on Finance and Banking. Allegedly, since Poroshenko claimed the post of Chairman of the Ukrainian Parliament for himself, the Socialist Party of Ukraine chose to be part of the Alliance of National Unity because it was promised that their party leader, Oleksandr Moroz, would be elected chairman if the coalition were formed. This left Poroshenko's Our Ukraine and their ally Yulia Tymoshenko Bloc out of the Government. 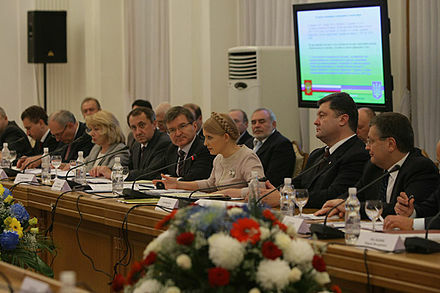 Poroshenko at the Russian-Ukrainian international commission meeting in 2009. Minister for Foreign Affairs of Ukraine Petro Poroshenko in the Polish Senate with former Greek prime minister George Papandreou. 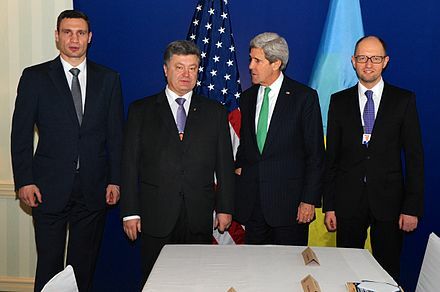 Ukrainian opposition leaders Vitali Klitschko, Poroshenko (second left) and Arseniy Yatsenyuk (right) with United States Secretary of State John Kerry (second right) at the Munich Security Conference, 2014. 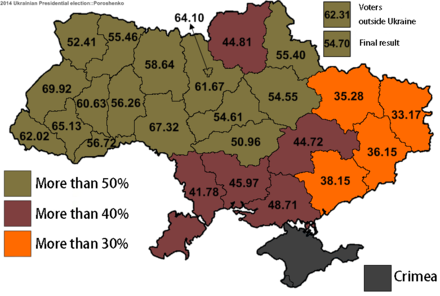 2014 presidential election percentage of vote for Poroshenko. President of Ukraine Petro Poroshenko and President of European Council Donald Tusk in Brussels, 2015. 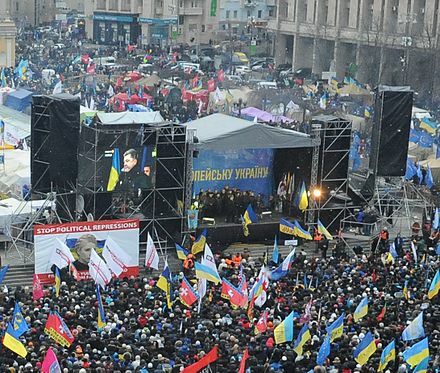 Poroshenko on stage speaking to Euromaidan protesters on 8 December 2013. Elections in Ukraine are held to choose the President, Verkhovna Rada, and local governments. Referendums may be held on special occasions. Ukraine has a multi-party system, with numerous parties in which often not a single party has a chance of gaining power alone, and parties must work with each other to form coalition governments. Yuriy Vitaliyovych Lutsenko is a Ukrainian politician and the current Prosecutor General of Ukraine. The Petro Poroshenko Bloc "Solidarity", is a political party in Ukraine, formed on 27 August 2014. However, it has its roots in a parliamentary group called Solidarity dating from 2000 and has existed since in various forms as a political outlet for Petro Poroshenko. Referendums in Ukraine, according to the Ukrainian Constitution, are one of the lawful forms of expression of people's will. Arseniy Petrovych Yatsenyuk is a Ukrainian politician, economist and lawyer who served as the 13th Prime Minister of Ukraine from 27 February 2014 to 14 April 2016. The Ukrainian Democratic Alliance for Reform was a political party in Ukraine headed by retired Ukrainian professional heavyweight boxer and the WBC world heavyweight champion emeritus Vitali Klitschko. It merged into the Petro Poroshenko Bloc on 28 August 2015. However, in 2017 UDAR was still registered as a political party and it employed two persons. The party is an observer member of the European People's Party (EPP) since 2013. Serhiy Taruta is a Ukrainian politician and current member of the Ukrainian parliament, Ukrainian businessman, sometimes called an oligarch, founder of Industrial Union of Donbas, former President of FC Metalurh Donetsk, and the former governor of Donetsk Oblast. Ihor Palytsia is a Ukrainian businessmen and politician. From May 2014 till May 2015 he worked as Governor of Odessa Oblast. Since November 2015 Palytsia is chairman of the Volyn Oblast regional parliament. Maryna Anatolyivna Poroshenko is the First Lady of Ukraine and the wife of Ukrainian President Petro Poroshenko. People's Front is a political party in Ukraine founded by Arseniy Yatsenyuk and Oleksandr Turchynov in 2014. Opposition Bloc is a Ukrainian political party that was founded in 2014 as six parties that did not endorse Euromaidan merged. Legally, the party was created by renaming the lesser-known party Leading force. The second Yatsenyuk government was created in Ukraine after the 2014 Ukrainian parliamentary election. On 2 December 2014, 288 members of the Ukrainian parliament approved the composition of the cabinet. The Government was backed by Petro Poroshenko Bloc, People's Front, Self Reliance, Fatherland and Radical Party. Alexander "Sasha" Borovik is an American and European lawyer and a technology entrepreneur. From 2015 to 2016, as a technocrat he was invited to Ukraine where after the revolution in 2014, he initially served as the First Deputy Minister of Economy, and later became a deputy governor and an adviser to the governor of Odessa Oblast, Mikheil Saakashvili. Olexiy Petrovych Poroshenko is a Ukrainian politician and diplomat. ↑ "People's Deputy of Ukraine of the III convocation". Official portal (in Ukrainian). Verkhovna Rada of Ukraine. Archived from the original on 5 April 2015. Retrieved 22 December 2014. ↑ "People's Deputy of Ukraine of the IV convocation". Official portal (in Ukrainian). Verkhovna Rada of Ukraine. Archived from the original on 13 January 2016. Retrieved 22 December 2014. ↑ "Registered candidates". Elections of the People's Deputies of Ukraine (in Ukrainian). Central Election Commission of Ukraine. Archived from the original on 1 January 2015. Retrieved 24 December 2014. ↑ "People's Deputy of Ukraine of the V convocation". Official portal (in Ukrainian). Verkhovna Rada of Ukraine. Archived from the original on 8 June 2015. Retrieved 22 December 2014. ↑ "People's Deputy of Ukraine of the VII convocation". Official portal (in Ukrainian). Verkhovna Rada of Ukraine. Archived from the original on 13 January 2016. Retrieved 22 December 2014. ↑ "XE: Convert UAH/EUR. Ukraine Hryvnia to Euro Member Countries". xe.com. Retrieved 26 November 2018. ↑ Кабмин утвердил новые зарплаты для Порошенко и Гройсмана (in Russian). bigmir.net. 1 August 2016. Archived from the original on 2 August 2016. 1 2 "Petro Poroshenko's biography". Archived from the original on 10 February 2017. Retrieved 22 January 2019. 1 2 Lukas Alpert (29 May 2014). "Petro Poroshenko to Be Inaugurated as Ukraine President June 7". The Wall Street Journal. Archived from the original on 29 May 2014. Retrieved 29 May 2014. "Rada decides to hold inauguration of Poroshenko on June 7 at 1000". Interfax-Ukraine. 3 June 2014. Archived from the original on 3 June 2014. Retrieved 3 June 2014. "Poroshenko sworn in as Ukrainian president". Interfax-Ukraine. 7 June 2014. Archived from the original on 1 July 2014. Retrieved 7 June 2014. 1 2 3 4 5 "Profile: Ukraine's President Petro Poroshenko". BBC. 7 June 2014. Archived from the original on 26 May 2014. Retrieved 10 March 2016. ↑ "Матір та старший брат Петра Порошенка - білі плями біографії майбутнього Президента" (in Ukrainian). Vinbazar. 5 June 2014. ↑ Marcin Kosienkowski (2012). 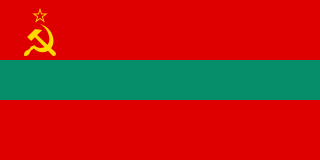 "Continuity and Change in Transnistria's Foreign Policy after the 2011 Presidential Elections". Academia.edu. p. 38. 1 2 3 4 5 6 7 8 9 10 11 12 13 14 15 16 17 18 19 20 21 22 23 24 25 26 27 28 Tadeusz A. Olszański; Agata Wierzbowska-Miazga (28 May 2014). "Poroshenko, President of Ukraine". OSW, Poland. Archived from the original on 8 March 2016. Retrieved 10 March 2016. 1 2 3 4 5 6 7 8 9 "Ukraine Election: The Chocolate King Rises". Spiegel Online. 22 May 2014. Archived from the original on 28 May 2014. 1 2 "Ukraine's tycoon Poroshenko confirms plans to sell assets". ITAR-TASS. 26 May 2014. Archived from the original on 27 May 2014. Retrieved 26 May 2014. ↑ Abram Brown (31 March 2014). "The Willy Wonka of Ukraine Is Now The Leading Presidential Candidate". Forbes . Archived from the original on 1 December 2008. Retrieved 19 April 2014. 1 2 "Poroshenko is not going to sell Channel 5 TV". Kyiv Post. 23 May 2010. Archived from the original on 25 May 2010. Retrieved 25 May 2010. ↑ Brian Bonner (8 March 2012). "Eight Ukrainians make Forbes magazine's list of world billionaires". Kyiv Post . Archived from the original on 1 December 2008. Retrieved 8 March 2012. ↑ "Billionaire No More: Ukraine President's Fortune Fades With War". Bloomberg Business. 8 May 2015. Archived from the original on 26 May 2015. Retrieved 22 May 2015. ↑ Vitaliy Sych (30 October 2015). Порошенко растет, Ахметов падает – свежий Топ-100 самых богатых украинцев [Poroshenko grows, Akhmetov falls – Fresh Top 100 richest Ukrainians] (in Russian). Novoe Vremia. Archived from the original on 11 March 2016. Retrieved 10 March 2016. ↑ "Alle schimmige geldstromen belastingontwijkende President Oekraïne in één handig overzicht". 24 November 2016. Archived from the original on 15 April 2017. Retrieved 9 July 2017. ↑ Концерн "Укрпромінвест" оголосив про ліквідацію [Concern "Ukrprominvest" announced its liquidation] (in Ukrainian). UNIAN. 24 April 2012. Archived from the original on 1 December 2008. Retrieved 26 May 2014. ↑ Kuzio, Taras; Frishberg, Alex (21 February 2008). "Ukrainian Political Update" (PDF). Frishberg & Partners, Attorneys at Law. p. 22. Archived (PDF) from the original on 3 March 2016. 1 2 3 4 "Петро Порошенко виходить на роботу" [Poroshenko goes to work]. Ukrayinska Pravda (in Ukrainian). 6 June 2014. Archived from the original on 3 March 2016. ↑ Freedom House (2004). Nations in Transit 2004: Democratization in East Central Europe and Eurasia. Rowman & Littlefield Publishers. pp. 638–. ISBN 978-1-4617-3141-2. Archived from the original on 13 January 2016. ↑ Hanly, Ken (25 May 2014). "Op-Ed: Petro Poroshenko the oligarch poised to become Ukraine president". Digital Journal. Archived from the original on 27 May 2014. Retrieved 26 May 2014. 1 2 3 4 Luke Harding and Oksana Grytsenko (23 May 2014). "Chocolate tycoon heads for landslide victory in Ukraine presidential election". The Guardian . Archived from the original on 9 June 2014. "The Return of the Prodigal Son, Who Never Left Home". The Ukrainian Week. 30 March 2012. Archived from the original on 30 October 2013. Retrieved 17 June 2014. "Who will lead Ukrainian Orthodox Church (Moscow Patriarchate) and where?". Den . 27 February 2014. Archived from the original on 28 February 2014. Retrieved 17 June 2014. ↑ Alex Rodriguez (27 September 2005). "In Ukraine, old whiff of scandal in new regime". Chicago Tribune . Archived from the original on 2 October 2013. 1 2 3 "Biography" (in Russian). Korrespondent.net. Archived from the original on 19 July 2006. ↑ "Prosecutors Close Criminal Case Against Yushchenko's Close Ally". Kiev Ukraine News Blog. 21 October 2005. Archived from the original on 7 April 2014. ↑ Tammy M. Lynch (28 October 2005). "Independent standpoint on Ukraine:Dismissal of Prosecutor-General, Closure of Poroshenko Case Create New". ForUm. Archived from the original on 3 November 2013. Retrieved 3 March 2012. 1 2 "Regions Party not to vote for Poroshenko's appointment Ukraine's foreign minister". Kyiv Post . Interfax-Ukraine. 8 October 2009. Archived from the original on 5 June 2011. Retrieved 8 October 2009. ↑ "Ukrainian president proposes Petro Poroshenko for foreign minister". Interfax-Ukraine. 7 October 2009. Archived from the original on 11 March 2016. 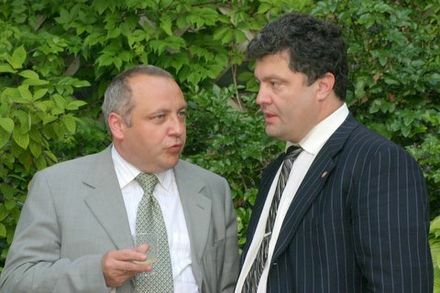 ↑ "Rada appoints Poroshenko Ukraine's foreign minister". Interfax-Ukraine. 9 October 2009. Archived from the original on 23 May 2012. Retrieved 5 December 2009. ↑ By 240 out of 440 MPs registered in the session hall. In particular, 151 MPs of the Bloc of Yulia Tymoshenko faction, 63 of the Our Ukraine-People's Self-Defense Bloc, 20 members of the Bloc of Volodymyr Lytvyn, one deputy of the Party of Regions, one member of the Communist Party faction, and four deputies not belonging to any faction voted for the nomination. ↑ "Poroshenko put on Ukraine's NSCD". Kyiv Post . Interfax-Ukraine. 12 October 2009. Archived from the original on 19 April 2014. ↑ "Poroshenko: Ukraine could join NATO in 1–2 years, with political, public will". Kyiv Post. Interfax-Ukraine. 4 December 2009. Archived from the original on 30 January 2011. Retrieved 5 December 2009. ↑ "Mass Media:Poroshenko heads Ministry of Economy". UNIAN. 23 February 2012. Archived from the original on 24 February 2012. Retrieved 9 March 2012. ↑ "Regions Party: Poroshenko appointed economy minister, Kolobov appointed finance minister". Kyiv Post. Interfax-Ukraine. 23 February 2012. Archived from the original on 9 March 2012. Retrieved 9 March 2012. ↑ "President:Prime Minister nominated Petro Poroshenko for Minister of Economy". President.gov.ua. 23 February 2012. Archived from the original on 28 January 2014. Retrieved 3 March 2012. ↑ "Ukrainian president wants Poroshenko to head economic development and trade ministry". Kyiv Post . Interfax-Ukraine. 9 March 2012. Archived from the original on 9 March 2012. Retrieved 9 March 2012. ↑ "Poroshenko appointed economic development and trade minister of Ukraine". Kyiv Post . Interfax-Ukraine. 23 March 2012. Archived from the original on 1 December 2008. Retrieved 23 March 2012. "Poroshenko explains reasons behind accepting economy minister's post". Kyiv Post . Interfax-Ukraine. 23 March 2012. Archived from the original on 23 March 2012. Retrieved 23 March 2012. ↑ Порошенко Петр Алексеевич [Petr Aleksiyovych Poroshenko] (in Russian). LIGA.net. Archived from the original on 5 March 2013. Retrieved 20 February 2013. ↑ Полтавська область. Одномандатний виборчий округ №112 [Vinnytsia region. The single-mandate constituency № 12] (in Ukrainian). Central Election Commission of Ukraine. Archived from the original on 21 February 2014. ↑ "Minister Poroshenko and his father registered as self-nominees for Vinnytsia region". Kyiv Post. Interfax-Ukraine. 15 August 2012. Archived from the original on 20 December 2012. Retrieved 14 December 2012. ↑ "Poroshenko not intending to join any faction". Kyiv Post . Interfax-Ukraine. 12 December 2012. Archived from the original on 14 December 2012. Retrieved 14 December 2012. "Poroshenko fears uncontrolled economic situation in Ukraine due to foreign borrowing". Kyiv Post. Interfax-Ukraine. 20 June 2013. Archived from the original on 23 September 2013. Retrieved 20 June 2013. ↑ "Poroshenko's father changes his mind to withdraw his candidacy from elections". UNIAN. 25 September 2012. Archived from the original on 4 September 2014. ↑ "Poroshenko appears set to join race for Kyiv mayor". Ukraine Business Online. 12 February 2013. Archived from the original on 19 April 2014. Retrieved 15 February 2013. ↑ "Interview with Ukrainian presidential candidate Petro Poroshenko". The Washington Post. 25 April 2014. Archived from the original on 4 June 2014. ↑ "Ukraine: Speaker Oleksandr Turchynov named interim president". BBC News. 23 February 2014. Archived from the original on 27 March 2014. Retrieved 29 March 2014. "Ukraine protests timeline". BBC News. 23 February 2014. Archived from the original on 19 February 2014. Retrieved 29 March 2014. ↑ Главная | Центр соціальних та маркетингових досліджень SOCIS Archived 21 May 2014 at the Wayback Machine . Socis.kiev.ua. Retrieved 28 May 2014. ↑ "Klitschko will run for mayor of Kyiv". Interfax-Ukraine. 29 March 2014. Archived from the original on 30 March 2014. Retrieved 29 March 2014. ↑ "Klitschko believes only presidential candidate from democratic forces should be Poroshenko". Interfax-Ukraine. 29 March 2014. Archived from the original on 11 October 2014. Retrieved 29 March 2014. ↑ Colin Freeman (29 March 2014). "Petro Poroshenko, the billionaire chocolate baron hoping to become Ukraine's next president". The Daily Telegraph. Archived from the original on 30 March 2014. Retrieved 29 March 2014. ↑ "Ukraine: former boxer Vitaliy Klitschko ends presidential bid and backs Poroshenko". Euronews. 29 March 2014. Archived from the original on 30 March 2014. ↑ "Poroshenko ready to sell Roshen if elected president". Interfax-Ukraine. 2 April 2014. Archived from the original on 7 April 2014. Retrieved 2 April 2014. ↑ "Question of Ukraine's membership of NATO may split country – Poroshenko". Interfax-Ukraine. 2 April 2014. Archived from the original on 7 April 2014. Retrieved 2 April 2014. 1 2 3 "Poroshenko Declares Victory in Ukraine Presidential Election". The Wall Street Journal. 25 May 2014. Archived from the original on 28 May 2014. Retrieved 29 May 2014. ↑ "Polska Razem czarnym koniem? Mocne słowa Gowina" [Polish Total black horse? Strong words Gowin] (in Polish). 12 April 2014. Archived from the original on 15 April 2014. Retrieved 14 April 2014. ↑ "Poroshenko wins presidential election with 54.7% of vote – CEC". Interfax-Ukraine. 29 May 2014. Archived from the original on 29 May 2014. ↑ "Ukraine talks set to open without pro-Russian separatists". The Washington Post . 14 May 2014. Archived from the original on 28 May 2014. Retrieved 29 May 2014. ↑ "Q&A: Ukraine presidential election". BBC News. 7 February 2010. Archived from the original on 29 April 2014. Retrieved 29 May 2014. ↑ "Poroshenko wins presidential election with 54.7% of vote – CEC". Radio Ukraine International. 29 May 2014. Archived from the original on 29 May 2014. Retrieved 29 May 2014. ↑ "New Ukrainian president will be elected for 5-year term – Constitutional Court". Interfax-Ukraine. 16 May 2014. Archived from the original on 17 May 2014. Retrieved 29 May 2014. 1 2 "Poroshenko: 'No negotiations with separatists'". Deutsche Welle. 8 May 2014. Archived from the original on 24 May 2014. 1 2 3 4 "Ukraine crisis timeline". BBC News. Archived from the original on 30 May 2014. Retrieved 29 May 2014. 1 2 3 4 5 "Poroshenko promises calm 'in hours' amid battle to control Donetsk airport". The Guardian . 26 May 2014. Archived from the original on 29 May 2014. Retrieved 29 May 2014. ↑ "EU & Ukraine 17 April 2014 FACT SHEET" (PDF). European External Action Service. 17 April 2014. Archived from the original (PDF) on 14 May 2014. Retrieved 29 May 2014. ↑ Gutterman, Steve; Polityuk, Pavel (18 March 2014). "Putin signs Crimea treaty, will not seize other Ukraine regions". Reuters. Archived from the original on 29 March 2014. Retrieved 26 March 2014. ↑ "In Ukrainian election, chocolate tycoon Poroshenko claims victory". The Washington Post . 25 May 2014. Archived from the original on 4 September 2014. 1 2 3 4 5 6 7 "Ukraine president vows not to give up Crimea". The Guardian . theguardian.com. 7 June 2014. Archived from the original on 13 June 2014. "Ukraine's Poroshenko sworn in and sets out peace plan". BBC News. 7 June 2014. Archived from the original on 9 June 2014. "Excerpts from Poroshenko's speech". BBC News Online. 7 June 2014. Archived from the original on 8 June 2014. 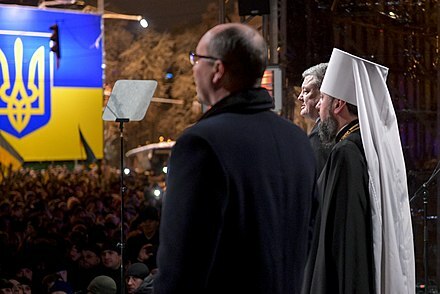 "Ukraine's President Poroshenko pushes for peace at inauguration". Euronews. 7 June 2014. Archived from the original on 9 June 2014. "Poroshenko offers escape for rebels but no compromise over weapons". Euronews. 7 June 2014. Archived from the original on 1 July 2014. Промова президента України під час церемонії інавгурації. Повний текст [Speech by President of Ukraine during the inauguration ceremony. Full text]. Ukrayinska Pravda (in Ukrainian). 7 June 2014. Archived from the original on 7 June 2014. 1 2 На інавгурацію Порошенка прибудуть делегації з 56 країн [At the inauguration Poroshenko come delegations from 56 countries]. Ukrayinska Pravda (in Ukrainian). 7 June 2014. Archived from the original on 9 June 2014. Retrieved 7 June 2014. ↑ "Ukraine: International recognition for President Poroshenko". Euronews. 7 June 2014. Archived from the original on 8 July 2014. Retrieved 7 June 2014. ↑ Тимошенко: президент Порошенко – потужний фактор стабільності [Tymoshenko: President Poroshenko – a powerful factor of stability]. Ukrayinska Pravda (in Ukrainian). 7 June 2014. Archived from the original on 9 June 2014. Retrieved 7 June 2014. ↑ "Poroshenko doesn't rule out roundtable in Donetsk involving parties to conflict". Interfax-Ukraine. 12 June 2014. Archived from the original on 1 July 2014. Retrieved 12 June 2014. 1 2 "Poroshenko warns of 'detailed Plan B' if Ukraine ceasefire fails". Al Jazeera. 22 June 2014. Archived from the original on 1 July 2014. 1 2 "Amendments to Ukraine's Constitution to be tabled in parliament this week – Poroshenko". Interfax-Ukraine. 16 June 2014. Archived from the original on 1 July 2014. ↑ "Poroshenko suggests granting status of regions to Crimea, Kyiv, Sevastopol, creating new political subdivision of 'community'". Interfax-Ukraine. 26 June 2014. Archived from the original on 1 July 2014. Retrieved 26 June 2014. 1 2 "Authorities in Ukrainian regions may be allowed to determine status of national minority languages". Interfax-Ukraine. 26 June 2014. Archived from the original on 1 July 2014. Retrieved 26 June 2014. 1 2 "Ukrainian president proposes to appoint representatives to regions". Interfax-Ukraine. 26 June 2014. Archived from the original on 1 July 2014. Retrieved 26 June 2014. ↑ "Ukraine's Poroshenko names new defence chiefs in shake-up". Reuters. 3 July 2014. Archived from the original on 3 July 2014. ↑ "Documents signed in Minsk don't envision federalization, autonomy for Donbas – Poroshenko Archived 24 February 2015 at the Wayback Machine ". Interfax-Ukraine. 12 February 2015. ↑ Poroshenko rules out federalization of Ukraine Archived 24 June 2015 at the Wayback Machine . Interfax-Ukraine. 23 June 2015. Ukraine to remain unitary state after constitution is amended – Poroshenko Archived 27 June 2015 at the Wayback Machine . Interfax-Ukraine. 26 June 2015. ↑ Semi-presidential form of government is optimal for Ukraine – Poroshenko Archived 2 August 2015 at the Wayback Machine . Interfax-Ukraine. 30 June 2015. ↑ "Ukraine President Poroshenko Calls Snap General Election". Bloomberg News. 25 August 2014. Archived from the original on 25 August 2014. ↑ "Ukraine crisis: President calls snap vote amid fighting". BBC News. 25 August 2014. Archived from the original on 27 August 2014. Retrieved 30 August 2014. "Ukraine's Petro Poroshenko Dissolves Parliament, Sets Election Date". The Moscow Times . 26 August 2014. Archived from the original on 27 August 2014. ↑ "Poroshenko hopes early parliamentary elections in Ukraine will take place in October". Interfax-Ukraine. 26 June 2014. Archived from the original on 27 October 2014. Retrieved 30 August 2014. ↑ "Poroshenko hopes for early parliamentary elections in Ukraine this fall – presidential envoy". Interfax-Ukraine. 19 June 2014. Archived from the original on 18 October 2014. Retrieved 30 August 2014. ↑ "In Ukrainian election, chocolate tycoon Poroshenko claims victory". The Washington Post . 25 May 2014. Archived from the original on 4 September 2014. Retrieved 30 August 2014. ↑ "Poroshenko wants coalition to be formed before parliamentary elections". Interfax-Ukraine. 27 August 2014. Archived from the original on 3 July 2014. Retrieved 30 August 2014. "Solidarity Party to be renamed Bloc of Petro Poroshenko – congress". Interfax-Ukraine. 27 August 2014. Archived from the original on 31 August 2014. ↑ Порошенко і порожнеча (in Ukrainian). 16 May 2014. Archived from the original on 30 August 2014. Retrieved 30 August 2014. ↑ "Bloc of Petro Poroshenko to change name". Ukrinform.net. 10 March 2015. Retrieved 6 November 2015. ↑ Порошенко: час очистити Україну від комуністичних символів [Poroshenko: time to clear Ukraine of communist symbols]. BBC Ukrainian (in Ukrainian). 17 May 2015. Archived from the original on 13 January 2016. Retrieved 30 March 2016. ↑ "Ukraine to rewrite Soviet history with controversial 'decommunisation' laws Archived 23 July 2016 at the Wayback Machine ". The Guardian . 20 April 2015. ↑ "Poroshenko to Sell Roshen If Elected Ukrainian President: Bild Archived 22 March 2017 at the Wayback Machine ". Bloomberg. 2 April 2014. ↑ "Powerful Ukrainian Governor Kolomoyskiy Resigns". RadioFreeEurope/RadioLiberty. 25 March 2015. Retrieved 9 June 2015. ↑ "IN UKRAINE THERE WILL BE NO MORE OLIGARCHS – POROSHENKO". 5.ua. 30 May 2015. Archived from the original on 1 June 2015. Retrieved 30 May 2015. ↑ "Poroshenko enacts law granting fighters for Ukraine's independence in 20th century combatant status". UNIAN . 23 December 2018. ↑ "Consolidated version of Regulation No 1 determining the languages to be used by the European Economic Community" (PDF). Europa . European Union . Retrieved 30 July 2010. ↑ "Languages of Europe – Official EU languages". European Commission . Retrieved 27 June 2016. 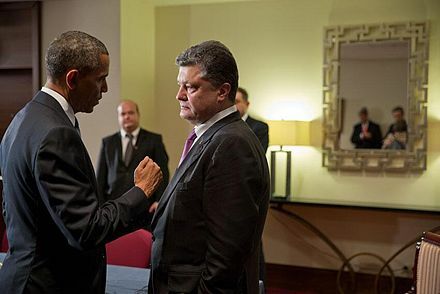 ↑ "Meeting Poroshenko and Biden: main results". nv.ua. 8 December 2015. Archived from the original on 9 December 2015. Retrieved 8 December 2015. ↑ Wood, Paul (23 May 2018). "Ukraine 'paid Trump lawyer for talks'" . Retrieved 26 November 2018– via www.bbc.com. ↑ "BBC pays damages to Ukraine President Petro Poroshenko over report". BBC. 28 March 2019. Retrieved 29 March 2019. "We apologise to Mr Poroshenko for any distress caused and have agreed to pay him damages, legal costs and have participated in a joint statement in open court," the broadcaster said. ↑ https://www.independent.co.uk/news/media/bbc-ukraine-poroshenko-trump-michael-cohen-defamation-a8844061.html "Jane Phillips, counsel for the BBC, said: “The BBC is happy to acknowledge that these claims about the claimant are completely untrue, and it is here, through me, to apologise to the claimant for any distress and embarrassment caused to him by the article and the broadcast.”"
↑ Порошенко заборонив будь-яку співпрацю з Росією у військовій сфері [Poroshenko forbade any cooperation with Russia in the military sphere]. Ukrayinska Pravda (in Ukrainian). 16 June 2014. Archived from the original on 17 June 2014. Retrieved 16 June 2014. ↑ "Ukraine cannot normalize relations with Russia without return of Crimea, says Poroshenko". Interfax-Ukraine. 26 June 2014. Archived from the original on 27 June 2014. Retrieved 26 June 2014. ↑ "Eastern Ukraine tensions figure in Putin and Poroshenko talks". Moscow News. 26 August 2014. Archived from the original on 3 September 2014. Retrieved 28 August 2014. 1 2 3 "EU signs pacts with Ukraine, Georgia and Moldova". BBC News. 27 June 2014. Archived from the original on 27 June 2014. Retrieved 27 June 2014. ↑ "Ukraine has no alternative to Euro-Atlantic integration – Poroshenko". Interfax-Ukraine . 23 December 2014. Archived from the original on 4 March 2016. Retrieved 30 March 2016. "Ukraine abolishes its non-aligned status – law". Interfax-Ukraine. 23 December 2014. Archived from the original on 24 December 2014. Retrieved 30 March 2016. "Ukraine's complicated path to NATO membership". Euronews . 23 December 2014. Archived from the original on 4 March 2016. Retrieved 30 March 2016. "Ukraine Takes Step Toward Joining NATO". New York Times . 23 December 2014. Archived from the original on 22 March 2017. Retrieved 30 March 2016. ↑ "New Year, new hope as Ukraine paves way for NATO membership". Euronews . 30 December 2014. Archived from the original on 4 March 2016. Retrieved 30 March 2016. 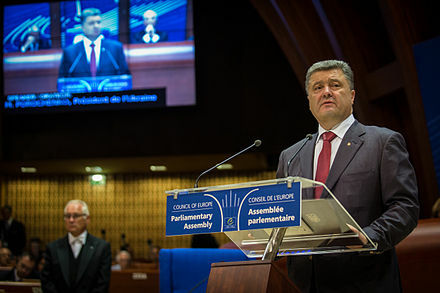 ↑ "Russia's actions prove need for NATO expansion – Poroshenko". Interfax-Ukraine. 22 September 2015. Archived from the original on 8 April 2016. Retrieved 30 March 2016. "Decision on referendum regarding Ukraine's membership in NATO to be made after reforms – Poroshenko". Interfax-Ukraine. 22 September 2015. Archived from the original on 8 April 2016. Retrieved 30 March 2016. "Ukraine-NATO cooperation is crucially important for global security due to Russian aggression – Poroshenko". Interfax-Ukraine. 22 September 2015. Archived from the original on 8 April 2016. Retrieved 30 March 2016. ↑ "Ukraine bans 41 international journalists and bloggers". CPJ. 16 September 2015. Archived from the original on 13 January 2016. Retrieved 10 March 2016. ↑ Umberto Bacchi (17 September 2015). "Ukraine: BBC boss slams 'shameful' ban on international journalists". International Business Times. Archived from the original on 4 March 2016. Retrieved 10 March 2016. 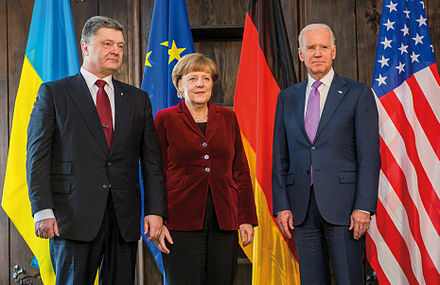 ↑ Polityuk, Pavel; Prentice, Alessandra (4 April 2016). "Ukraine's Poroshenko defends record after Panama leaks". Reuters. Archived from the original on 7 April 2016. Retrieved 7 April 2016. ↑ "Ukraine's leader set up secret offshore firm as battle raged with Russia". Guardian. 4 April 2016. Archived from the original on 7 April 2016. Retrieved 7 April 2016. ↑ "Panama Papers: Ukraine President Poroshenko denies tax claims". BBC News. 4 April 2016. Retrieved 7 April 2016. ↑ "Explore The Politicians in the Paradise Papers - ICIJ". ICIJ. Retrieved 6 December 2017. ↑ Sputnik. "Poroshenko's Son Becomes Ukrainian Parliament Member: Election Commission". sputniknews.com. Archived from the original on 20 December 2016. Retrieved 13 December 2016. ↑ Порошенко став дідом [Poroshenko has become a grandfather]. Ukrayinska Pravda (in Ukrainian). 7 June 2014. Archived from the original on 8 June 2014. Retrieved 7 June 2014. ↑ "Petro Poroshenko, discurs in limba romana la Cernauti". Hotnews.ro . Retrieved 26 October 2014. ↑ "Who Does Putin Want as Ukrainian President?" . Retrieved 26 November 2018. ↑ "Ukraine strips one of its president's rivals of his citizenship". The Economist . 28 July 2017. Retrieved 29 July 2017. ↑ "Mr. Petro Incognito. Таємна відпустка президента Порошенка (розслідування)". Радіо Свобода (in Ukrainian). Retrieved 6 April 2018. 1 2 "Порошенко на новорічні свята був у Києві, Івано-Франківську та на Мальдівах" (in Ukrainian). Retrieved 6 April 2018. ↑ "Перегляд декларації | ЄДИНИЙ ДЕРЖАВНИЙ РЕЄСТР ДЕКЛАРАЦІЙ". public.nazk.gov.ua. Retrieved 6 April 2018. ↑ Custodian of the Two Holy Mosques and President of Ukraine Attend Signing Ceremony of Draft Cooperation Program and Memoranda of Understanding between the Two Countries, Saudi Press Agency. ↑ "President presented a high state award to Ecumenical Patriarch Bartholomew". Official website of the President of Ukraine. 5 January 2019. Retrieved 5 January 2019. ↑ "Почесний Патріарх Філарет нагородив Порошенка церковним орденом". risu.org.ua. 10 January 2019. Retrieved 10 January 2019. ↑ "Філарет вручив Порошенку орден Андрія Первозванного". www.ukrinform.ua (in Ukrainian). 10 January 2019. Retrieved 12 January 2019.